With your business growing daily you need to be able to keep up with the demands that your business needs on a daily basis. 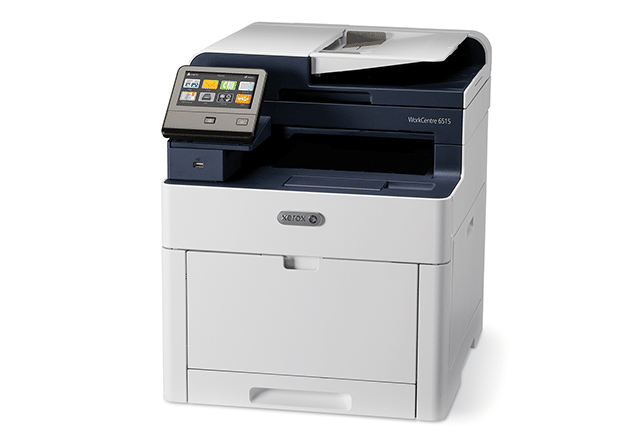 You need to be able to get your work done quickly and efficiently, with the Xerox WorkCentre 6515 DN MFP you can do just that, without worrying about missing any deadlines and getting ahead on your weekly tasks. Large color touchscreen offers intuitive multi-touch interface for adjusting settings and checking print status. Front-side USB port enables printing from and scanning to a portable storage device. Monthly duty cycle of 50,000 pages with a recommended monthly volume of 3,000 pages. Print directly from a mobile device using Wi-Fi Direct, Apple AirPrint, Google Cloud Print, Mopria, Xerox Mobile Link App, and Xerox Print Service Plug-In for Android. Your business is growing and deadlines keep coming, you should have a Xerox MFP that can handle your copy, print, scan and fax requirements. Keeping your files safe is the most important asset for any business.